One of the biggest barriers to providing a credible response to the learning and development needs of business is having trained Learning and Development professionals ready to provide effective learning interventions. Businesses are facing more challenges than ever before with buzzwords like skills crisis, demographic challenges, employee engagement, performance management and talent management all vying for assistance from L&D teams, while the teams themselves are facing their own new frontiers in the form of social learning, gamification, flipped classrooms and online learning challenges. 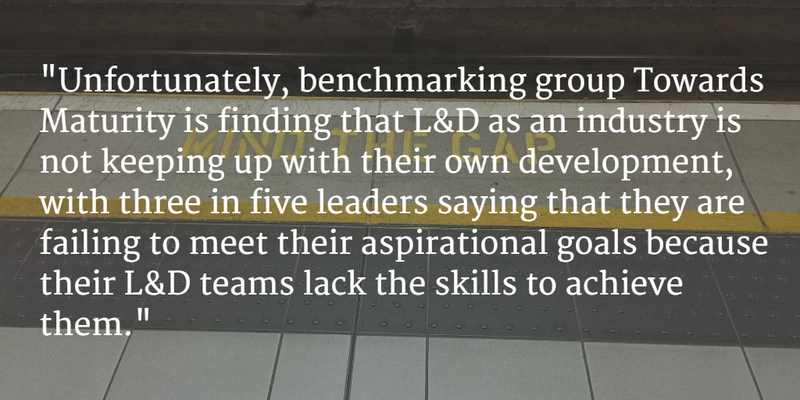 Unfortunately, benchmarking group Towards Maturity is finding that L&D as an industry is not keeping up with their own development, with three in five leaders saying that they are failing to meet their aspirational goals because their L&D teams lack the skills to achieve them. This is further problematised by the fact that only half of these leaders are investing in continuous professional development (CPD) for their team members, with one tenth of organisations completely in the dark as to how their teams are building their skills (1). Despite this lack of investment in L&D professionals, organisations want more than ever from their L&D departments. They want L&D professionals who can provide flexibility, wider access to learning, and the ability to improve induction processes, practical application of learning, sharing of best practice and effective face to face training. Add to this the desire to have teams that are well versed in social and collaborative learning, online training and delivery as well as coaching and mentoring, content delivery, technology and infrastructure as well as curation, data analytics, and performance consulting, and you start to see that the role of L&D teams is to be as versatile and agile as possible to meet the expanding goals of organisations for their provision of staff development. Unsurprisingly, benchmarking found that the top performing teams were twice as likely to have these skills already in place (1). It is a sad state of affairs that L&D teams are so focused on developing teams around them that they never get around to developing themselves. So how does today’s L&D manager overcome these problems? Firstly, you need to find out the extent of the problem. Running a training needs analysis on your team would be the best place to start, and gathering data on your organisation’s business strategy, and how the L&D team is expected to support these goals is the first step. Once you’ve located your gaps, it’s time to work out how to fill them, and for this you’ll need a budget. 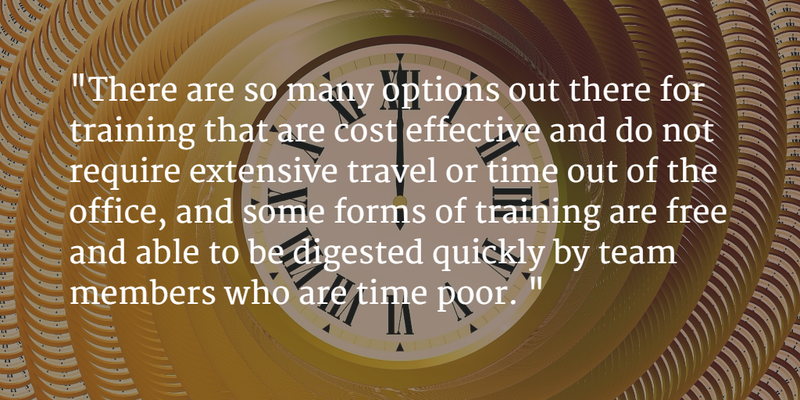 How much time and money you have to spend on training your staff will determine who and how many receive training in which areas. The most cost effective method is to train individuals or groups (depending on team size) as subject matter experts (or SMEs), enabling you to have trained individuals who are able to on-train, mentor and coach others in the team on their area of expertise. At this point you should not be afraid to push back on senior management to obtain the resources you need to train your team. 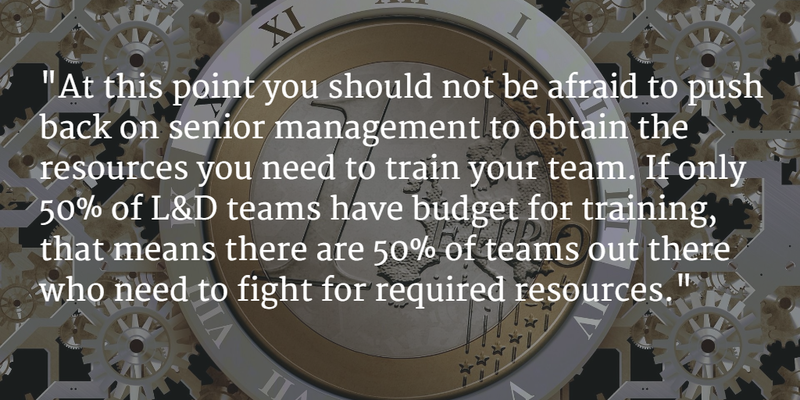 If only 50% of L&D teams have budget for training, that means there are 50% of teams out there who need to fight for required resources. A business case would be an excellent place to start, but even if you don’t get everything you want, there are other ways to structure your resources to ensure you still achieve success. Remember, an organisation’s development is only as good as the people who are on the ground laying the foundations, and without proper training, your organisation’s development powerhouse is a house of cards. Step Two: Who to Train? Once you have an understanding of the gaps you need to fill and an idea of your resources, it’s time to work out who is best placed to fill them, and how you are going to develop your training plan. It is vital to ensure that you are obtaining buy-in from your staff on who is best equipped to tackle each gap. Think of this stage as talent management, and act accordingly, ensuring team members are developed in the direction they want to move career-wise as much as is practicable. Also ensure that any team members who are not able to be formally trained in areas they show interest in, are given the opportunity to be coached by the team member who has undertaken formal training, so that they can be well placed as backup should the team require it. You can also implement weekly or fortnightly half hour breakfast sessions where team members take turns training the team on their specific areas of expertise. Step Three: How to Train? There are so many options out there for training that are cost effective and do not require extensive travel or time out of the office, and some forms of training are free and able to be digested quickly by team members who are time poor. Webinars, online, distance and blended learning options, seminars and one day courses abound. Sourcing ideas from your team is also an excellent solution: motivated team members may already have courses on their wish-list that they haven’t had the time to look into or the resources to attend. Step Four: Is it working? Benchmarking, metrics, L&D team engagement surveys, coaching and performance management will all tell you if you are succeeding in developing your team. Regularly conduct needs analyses on your team to ensure that you are keeping up to date with where the skill gaps lie, and ensure that these needs align with business strategy so that you aren’t jeopardising the credibility you are building with senior management in your attempts to increase team capacity. A further benefit is that as your team improves and this improvement provides quantifiable results, your ability to obtain resources from senior management to better develop your team should increase. There is no excuse for L&D professionals to ignore their own development. What message are you sending about your profession when you don’t take the time to develop yourself, but expect others to take time out of their busy schedules on your advice? Having agile and multi-skilled professionals is the first step to having a highly effective L&D team that is able to overcome the challenges businesses are facing in a world where knowledge capital is the difference between success and failure. This entry was posted in Training Theory, Training Tips and tagged analysis, benchmarking, best practice, coaching, CPD, development, effective, employee, employee development, employee engagement, employee training, engage, engagement, knowledge, L&D, learning, learning and development, manage, mentoring, metrics, motivation, needs, needs analysis, opportunity, professional, skill, skills, skills gap, statistics, Talent Management, training, training and development, training needs analysis. Bookmark the permalink.